We all love to do a bit of gardening; it can be fun and therapeutic. 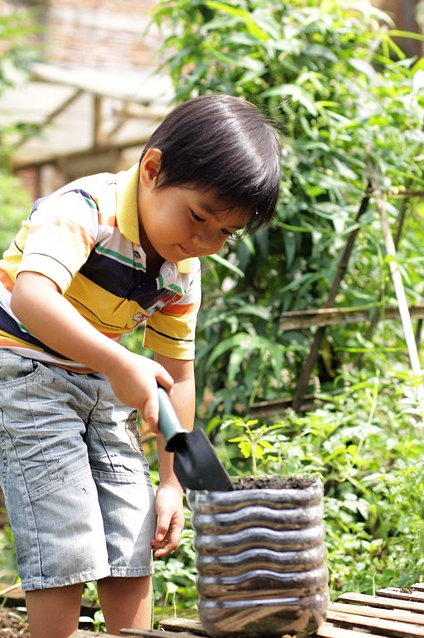 It’s also a great idea to encourage the kids to get outside and embrace the thrill of gardening. To do that you need to get the garden prepared for the children, and here’s how you do that. First things first, you need to make sure you figure out what the kids want to do in the garden. This means taking them around the local garden centre and letting them pick out what they’d like to plant. If you let them take charge of the process it will mean they develop more of an interest in it. Follow their lead; let them spearhead the project with you overseeing. Your first task is going to be to make sure the backyard is safe for the children. Kids are inquisitive, and generally act before they think. So, as the parent it’s your job to deal with any hazards. This means going around and repairing any damage beforehand. To do this, you’re going to need the right equipment. You can use the Makita DTD146 impact driver to deal with any loose screws. If anything needs drilling, you should dig out your Bosch power drill. You basically need to ensure you’re taking the right steps to make the garden child proof. For the kids to develop a real interest in the garden, they need to have an area for themselves. It’s no good encouraging them to go outside and then censoring where they go and what they do all the time. Try to leave an area free, like one of the flowerbeds or something. This is a fantastic way of developing their interest. They have an area with which they can experiment and do whatever they like. This is bound to make them more excited about getting out into the garden and planting things. If you want to garden, it’s essential you have the right tools for the job. So, in this instance, it’s going to be important for your kids to have the right tools as well. This means you need to buy child-friendly tools. They need to be small and light, but also practical. Maybe even think about getting the kids a tool box to make them feel special. Equip it with all the basic gardening tools. Try to go for plastic tools, not metal, for safety reasons. You might not want the kids messing around with things in the garden. Perhaps you already have things planted or flowers that you’re tending to. Well, the best way around this is to put up a small greenhouse. You can turn this into the children’s area. They can spend time in here working on their green fingers. The benefits of a greenhouse are that it doesn’t interfere with the garden, and it gives the kids their own private space. This will encourage them to enjoy it more. It’s important these days to encourage your kids to get out and about. They need to know as much as possible about the wonders of the great outdoors. So try to encourage them as much as you can. The garden is a great place to start because it’s self-contained. Use the ideas on this post to make your garden ready for the kids.